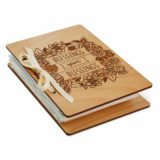 This Greeting Card Keeper is a must-have for card lovers and savers! The unique concept allows you to display your cards as home decor, while storing them, and giving you easy access to re-living precious milestones and memories. Comes in both Everyday and seasonal designs.